​Sometimes it seems like too much rain is worse than managing through a drought year. From salvaging flooded crops to managing nutrient density in forages plus potential for mycotoxins in grains, producers have a lot to think about, especially as recent weeks seem to be punctuated by long periods of drying weather and stormy weather alike. I believe strongly in the old adage that an ounce of prevention is worth a pound of cure. 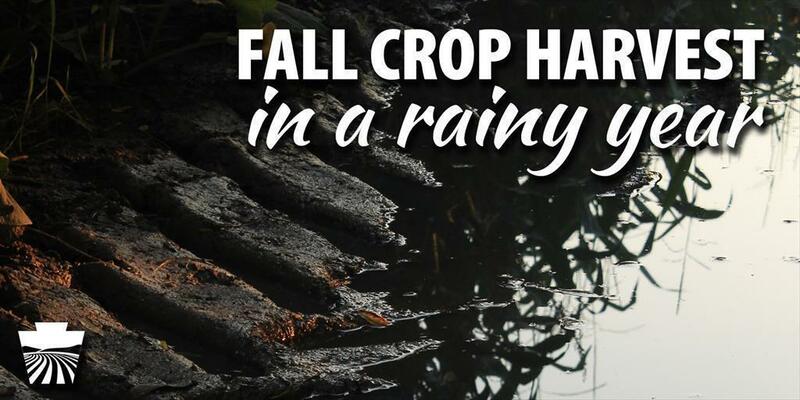 By making the best of a whole host of problems that all stem from the perfect storm of circumstances brought on by our wet summer, farms can avoid the issues that result in decreased production and increased health costs. I encourage you to think about these issues BEFORE you head to the field to harvest, and to consult with your veterinarian and nutritionist. Some areas of the state endured flooding of rivers and other waterways that left crops like corn under water. The dirt and silt that sticks to stalks and gets lodged in crevices can harbor pathogens like clostridium. There are easy ways to reduce the amount of clostridium in the harvested crop and in your animals' diet. Cut the crop higher. You're harvesting less of the most heavily-affected areas of the crop. Pick or shell corn rather than ensiling it. Put your flood-affected silage in a separate area from your unaffected silage – a bunker, an ag bag, or an upright silo. That way, you can test your silage later to see how to best use it in your operation… which may include not feeding it at all. It's important to make sure that you aren't forced to feed bad silage with good silage. Consider silage inoculants like propionic acid or a probiotic. A wet summer produced tall corn, which often simply spreads the nutrients out across more of your forage supply. Being careful at harvest and ensiling can pay dividends later. Your crop could have a variation in size, yield, and nutrient density, so be sure to chop and pack it well. Stressed forages dry faster, and your crop could dry abnormally, with variation. Those factors make it critical to test your feed. It could be low on energy, so identifying its characteristics early gives you more time to balance your ration properly so you don't lose both performance and health in your livestock. Mycotoxins can have a subtle presence in your grain crop. Watch for light test weights or broken grains, which are signs that fungus may have impacted your grain. Mycotoxins have an additive effect, so you may be able to feed one grain source with a small amount of mycotoxins present, but this same mycotoxin should not be in all feed ingredients at the same time. Test your grains so that, working with your veterinarian and nutritionist, you can ensure the safety and production of your animals. They can help you source grains that will complement your stored forages. Ultimately, the tips I've given you can all be boiled down to a few key points. When in doubt, keep your forages separate, test them, and seek help for how to best use them in your operation. Use best management practices to chop and pack ensiled feeds to ensure adequate fermentation. Don't be penny wise and pound foolish. Sometimes using a feed source just to use it up costs more in lost production and veterinary costs than it is to simply throw it out. Sometimes a little bit of the right ingredient to adequately balance the ration pays dividends in increased production – even with the higher cost of purchasing and using a supplement. Think holistically with your operation – how your harvest can affect your feed supply, how your feed supply can affect your ration, how your ration can affect production and health, and how that lost revenue or increased costs can impact the viability of your farm. And my big takeaway: this is a good year to seek professional help and advice. You have a veterinarian and a nutritionist for a reason. They can help you get your feed professionally tested, help you interpret the results, and help you apply them in ways that benefit your farm.. Use this resource, and make the best of a rainy year.